Spring has sprung and it is time for April Showers! We are grateful for the rain as it nourishes the earth back to life from the sleep of the cold winter. Just as God uses rain showers to grow and cultivate the land, God also showers us with what we need to grow to be more like Him. Ephesians 1:8 says, "He has showered his kindness on us, along with all wisdom and understanding." 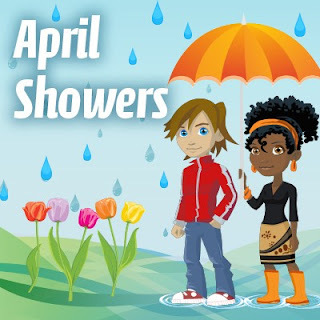 This week we celebrate April Showers. We are grateful for the gifts God has showered on us and we seek to use our talents to shower others with kindness, wisdom and understanding. The Mystery Code this week is: let it rain. Use this prize to shower your fellow Lightgliders with kindness this week! Glide on!